Developmental Exercises for Hacker Handbooks offers more than 175 class-tested exercise sets in a wide variety of formats, all designed for developing college writers. The exercises in each set include cross-curricular content and are thematically linked, usually focusing on the achievements of a famous person or group, so that students are reading real prose on inspiring topics rather than unrelated drill sentences. Most sections include practice and review exercises that identify problem areas and direct students to sections in their handbook for explanations and revision strategies. An answer key, in the back of the workbook, provides answers and feedback for practice exercises. 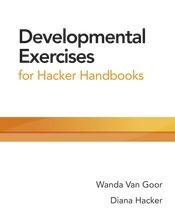 Developmental Exercises for Hacker Handbooks supports the following handbook titles by Diana Hacker and Nancy Sommers: A Pocket Style Manual, Eighth Edition, A Writer’s Reference, Ninth Edition, and Rules for Writers, Ninth Edition.